Denmark is a Scandinavian country in Europe. The southernmost of the Nordic countries, it is south-west of Sweden and south of Norway, and bordered to the south by Germany. The Kingdom of Denmark is a sovereign state that comprises Denmark proper and two autonomous constituent countries in the North Atlantic Ocean: the Faroe Islands and Greenland. Denmark has an area of 42,924 square kilometres and a population of 5.7 million. The country consists of a peninsula, Jutland, and an archipelago of 443 named islands, of which around 70 are inhabited. The islands are characterised by flat, arable land and sandy coasts, low elevation and a temperate climate. The Danish Parliament is called the Folketing (Danish: Folketinget). It is the legislature of the Kingdom of Denmark, passing Acts that apply in Denmark and, in limited cases, Greenland and the Faroe Islands. The Kingdom of Denmark does not have a single unified judicial system – Denmark has one system, Greenland another, and the Faroe Islands a third. Denmark's postal history begins with an ordinance of 24 December 1624 by King Christian IV, establishing a national postal service . This service consisted of nine main routes, and was to be operated by the mayor of Copenhagen and several guilds. Initially the mail was carried by foot, with riders being used after 1640. The first postage stamps were introduced on 1 April 1851, by a law passed on 11 March. [R2] So far there are only few stamps of Denamek that related to Paleontology. 05.11.1998 "Drawings of fossil animals from old books - Historiske Fossile"
[A1] Neils Stensen , also known as Nicholas Stenno (1638 - 1686), was a Danish pioneer in both anatomy and geology, who also studied fossils, especially shark teeth (one of such fossil teeth is depicted on stamp from 1998). He noted that the shark's teeth bore a striking resemblance to certain stony objects , found embedded within rock formations, that his learned contemporaries were calling glossopetrae or "tongue stones" are teeth of extinct animals. [A2] Ole Worm (1588- 1654) was originally physician in Copenhagen, but it was as a naturalist and founder of Denmark's very first museum that he inscribed his name in history. The museum was named after himself, "Museum Wormianum" and has some collections of fossils. 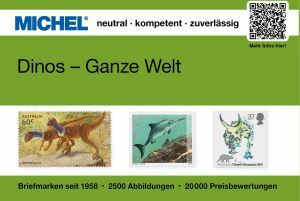 Ammonit Parapuzosia from collection of the museum is shown on stamp with face value of 3.75 at "Drawings of fossil animals from old books - Historiske Fossile" set from 1998.